Sponsors must be involved in the preparation process. Parents and guardians are encouraged to actively participate in their child&apos;s preparation, but parents cannot be sponsors for their child. A Baptismal godparent may be a sponsor. Your sponsor can be an aunt, uncle, godparent, sibling, friend, or friend&apos;s parent -- you choose a Confirmed adult who inspires you to live a better faith life! 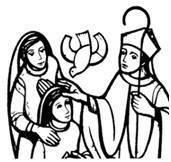 Attend BOTH our Confirmation rehearsal on May 5 and our Mass on May 7 (date subject to change). The role of the sponsor is to "take care that the confirmed behaves as a true witness of Christ and faithfully fulfills the obligations inherent in this sacrament." To read more about what a sponsor does, click here. Confirmation Candidates must also complete the Reflection Assignent with their sponsor, due on October 21, 2018. This assignment can be found on the left side of this page as a PDF document.